So Monica Culpepper gets the “My Best Friend’s Sister’s Boyfriend’s Brother’s Girlfriend Heard From This Guy Who Knows This Kid Who’s Going With the Girl Who Saw Ferris Pass Out at 31 Flavors Last Night” Award. Who is Monica Culpepper? Well, she’s on Survivor. I’m too busy carving wooden duck decoys in my free time to watch a bunch of people eat insects and form “alliances” (very cool), but that’s what Monica is best known for. She’s also known as the wife of former Minnesota Vikings and Florida Gators defensive tackle Brad Culpepper. That’s right … the other Culpepper. However, today Monica is probably most famous for having reportedly had the pleasure of dining with Tim Tebow. 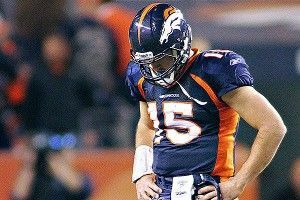 Over the last few days, as speculation grew that Peyton Manning might be taking his talents to altitude sickness, Tebow has remained mum. How was he feeling about the imminent arrival of the greatest quarterback to ever undergo multiple spinal surgeries? Tebow was quiet as a monk in a library. So thank you-know-who for people like Monica: “Brad and I just had dinner with Tim last week and I don’t think this comes as a shock or surprise to him that Manning was actually going to go there,” Culpepper told 970 WFLA. I miss home! I miss the South! Dinner conversation! I mean, I know Monica is paraphrasing here. Monica is always paraphrasing, am I right? And I don’t doubt that she had dinner with Tebow. But doesn’t this seem like a very well-tailored statement? Something disseminated specifically to gauge the interest of the Florida teams in Tebow? Man, I love this stuff. And you know the whispers are only going to get louder. If Miami and Jacksonville wind up being nonstarters, don’t be surprised to see another strangely similar quote in the next few weeks. Another friend, or wife of a friend, a warm, intimate dinner over bison, arugula, or sea bass and declarations of affinity for Minnesota, Boston, or Cleveland. At some point it’s bound to work. If the mountain doesn’t come to Tebow, then Tebow will go the mountain.